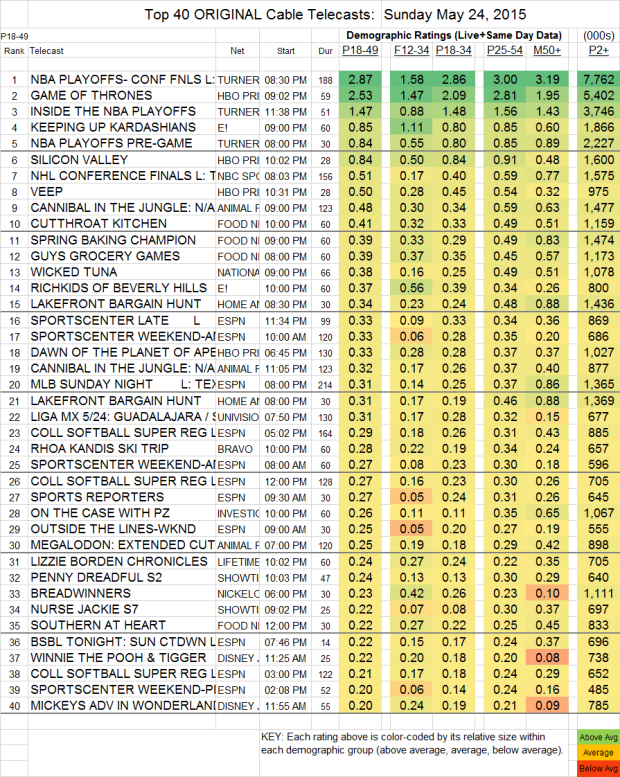 NETWORK UPDATE: The night’s only adjustment was a 0.1 bump for the rerun of CASTLE. CABLE HIGHLIGHTS: The holiday weekend shook the crown of GAME OF THRONES, which fell 0.61 from last week to 2.53, dropping it to 2d place for the night behind the 2.87 NBA PLAYOFFS game on TNT. Elsewhere on HBO, however, SILICON VALLEY was steady at 0.84, and VEEP gained a tenth to 0.50. (LAST WEEK TONIGHT was a rerun.) On Showtime, PENNY DREADFUL slipped 0.02 to 0.24, NURSE JACKIE gained 0.03 to 0.22, and HAPPYISH nearly doubled its 18-49s to 0.15 (also increasing total viewers by roughly 80K to 343K). On E!, KEEPING UP WITH THE KARDASHIANS fell steeply from last week’s Bruce Jenner episode, down 0.55 to 0.85, and it was followed by 0.37 for the premiere of RICHKIDS OF BEVERLY HILLS. LIZZIE BORDEN CHRONICLES (Lifetime) fell 0.02 to 0.24. NBO Sports Net’s NHL PLAYOFFS game was at 0.51. Animal Planet placed in the night’s Top 10 with 0.48 for CANNIBAL IN THE JUNGLE, and Food Network had 3 shows in the top dozen: CUTTHROAT KITCHEN at 0.41 (down 0.04), SPRING BAKING CHAMPION at 0.39 (down 0.06), and GUY’S GROCERY GAMES at 0.39 (down 0.01). On Bravo, a KANDI’S SKI TRIP episode of REAL HOUSEWIVES OF ATLANTA was at 0.28. SALEM (WGNAmerica) lost 0.05 to 0.13.